In a time where governments are continuously monitoring various types of communication of their citizens, there has been an increasing need for new secure and off-the-grid means of communication. One of the latest companies to satisfy this need is Open Garden. This start-up company is currently making a name of itself with their free app FireChat, which has been a popular means of communication for the protesters and activists in Hong Kong, Russia and Iran; places where the government can be very intrusive and at times block incoming phone and internet signals of opposing citizens. 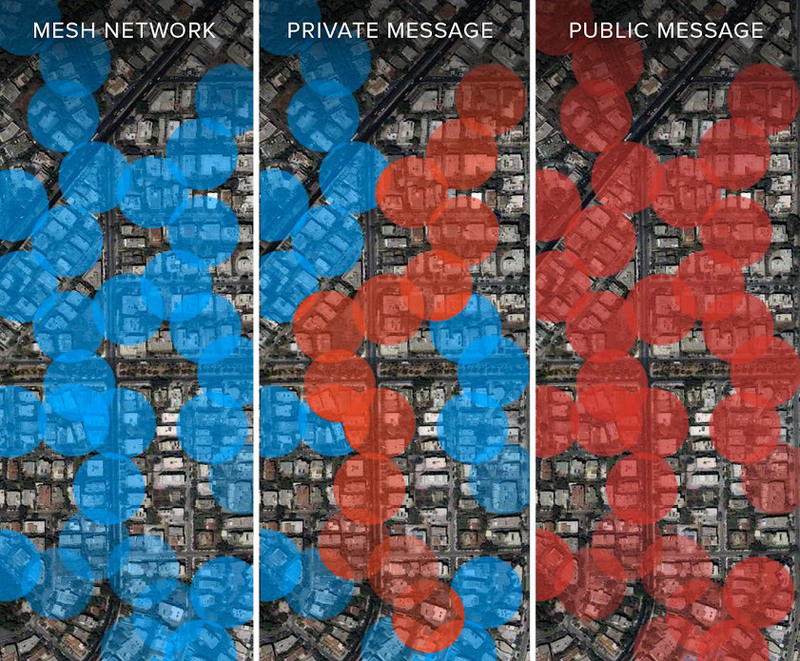 As mentioned in a recent Wired article, FireChat differs from regular telephone networks in that it uses peer-to-peer mesh networking so people can send each other texts and pictures without having to connect to each other in an online fashion. The network is hence an offline network which doesn’t need an internet connection, but rather utilizes Wi-Fi and Bluetooth to create a grid between these different networks. This means that sent messages travel from phone to phone to reach its desired destination. Open Garden estimates that if around 5 percent of mobile phone users in a city utilize the app to send their messages, it would take around 10 minutes to exchange texts between users. The app has also received some criticism with Wired stating that protesters and activists prefer using the FireChat app than any other software because it is “more clandestine and less traceable”, but that the app is still very flawed in the sense that messages sent in groups with FireChat aren’t private and can be monitored by basically everyone on the app. That’s why the creators of FireChat now urge their users to utilize a username not related to their real name and preferably use the new private messaging function which was introduced in July this year. North Carolina State University professor Mihail L. Sichitiu wrote extensively about new networks like FireChat in his article “Wireless mesh networks: opportunities and challenges”. According to him, the main drawback of mesh networking technology such as FireChat is its complexity. A mesh network is usually based on a combination of several types of wireless technology and relies heavily on the wireless nodes in the network. As we see with FireChat, a mobile user can simultaneously function as a router and a host. Other challenges facing these types of networks are provisioning, security and transmission power level. Especially the security aspect jumps out in the context of FireChat, since several groups of protesters and activists flocked to the app in order to use an app with an enlarged sense of privacy. Besides the argument that eavesdroppers can sniff out certain types of information in an mesh network, Sichitiu argues that each client (read: user) should be authenticated in order to prevent malicious users and that it is imperative to protect control data so it’ll be impossible for outside attackers to alter the behavior of a wireless mesh network (Sichitiu 6). FireChat might also not be as off-the-grid as its creators say it is. Okan Turkes, Hans Scholten, and Paul J. M. Havinga from the University of Twente argue that the networking app is not fully ad-hoc, because it exploits fixed access points in case of necessity. This means that the app might occasionally have to use fixed access points, which means FireChat sometimes has to use the internet to get information across to its users (Turkes et al 29-30). So, is FireChat the new way to safely communicate amongst each other? FireChat doesn’t seem as watertight as its creators make it out to be, but the network could definitely prove very important in countries with minimal communications infrastructure. This might also be the perfect area for FireChat to focus on in order to flourish even more in the near future. Sichitiu, Mihail L. “Wireless mesh networks: opportunities and challenges.” Dept. of Electrical and Computer Engineering. North Carolina State University (2008): 1-6. Turkes, Okan, Hans Scholten and Paul J.M. Havinga. “BLESSED with Opportunistic Beacons: A Lightweight Data Dissemination Model for Smart Mobile Ad-Hoc Networks.” Proceedings of the 10th ACM MobiCom Workshop on Challenged Networks, Paris, 7-11 september 2015. Eds. Katia Obraczka and Karin Anna Hummel. New York: ACM, 2015. 25-30. « What’s it like to BeMe?